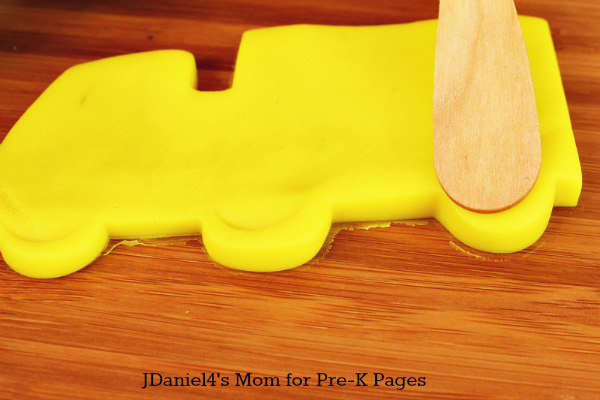 Play dough is a versatile resource. 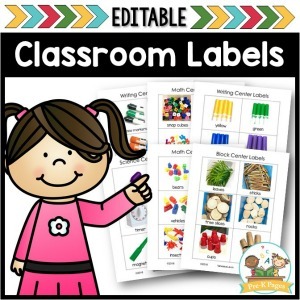 It can be used in many ways and can help teach lots of different concepts. We used play dough as a part of exploring transportation. 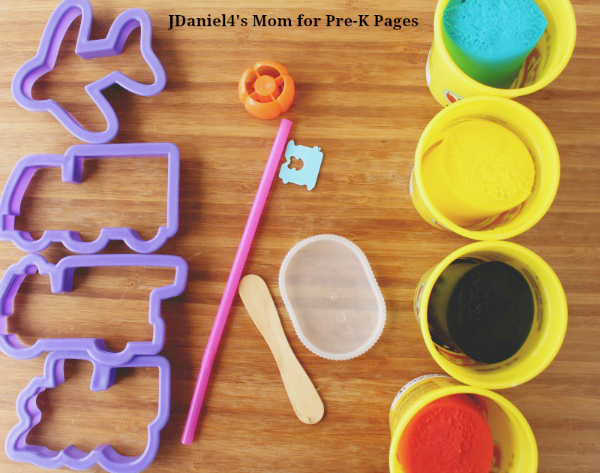 In general, play dough can help kids strengthen their hand muscles and develop the small muscles that control fine motor skills. 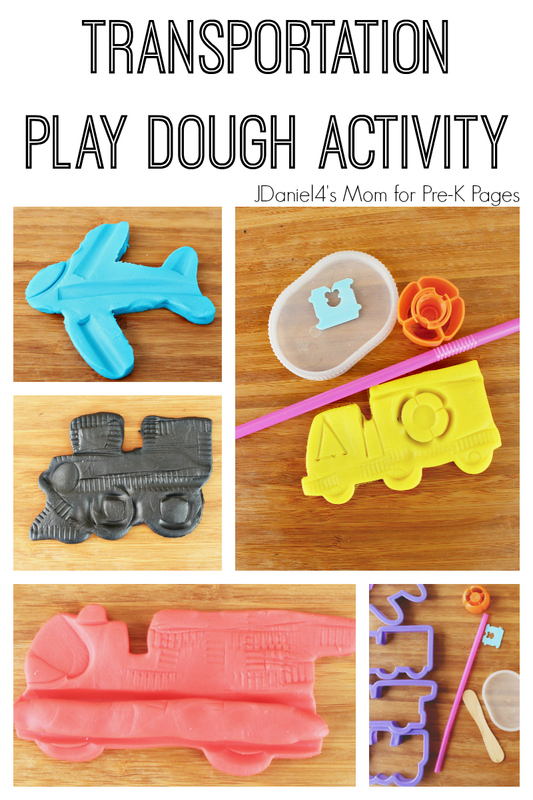 Play dough can also help concentration as children think about and plan what they are going to do and focus on molding and shaping the dough. 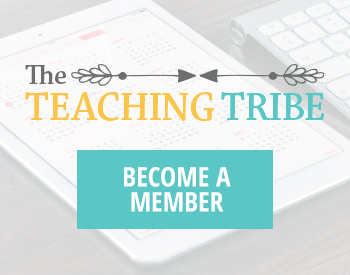 Kids can plan and work to develop their ideas, helping connect the mental with the physical activity. 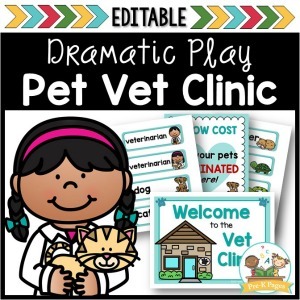 In this activity, children can use the available materials to create the details needed for the different transportation vehicles. They can compare and contrast the actual vehicle with the play dough version or between different play dough versions of the same vehicle. 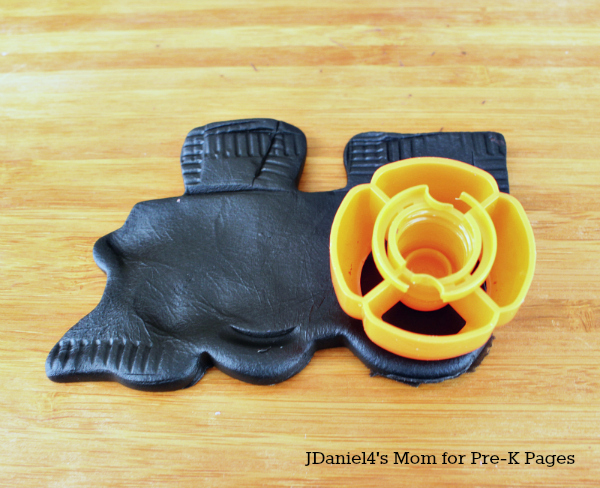 See, play dough can be a versatile learning tool! 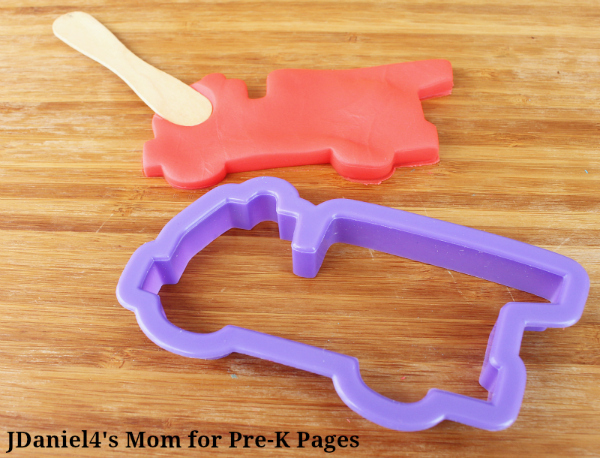 Kitchen items can be used to add details to transportation vehicle cut outs in play dough. 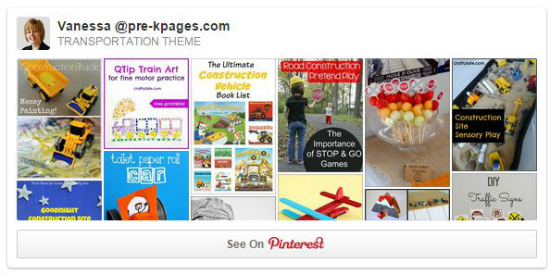 They can help children create windows, doors, wheels, ladders and so much more. These are the items we used to add the details. I chose items that I felt safe having children use. 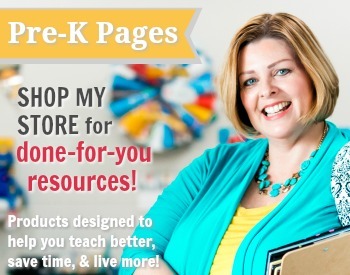 Choose items you feel comfortable with children handling, using, and exploring. Depending on the children’s ages and experience, many different kitchen items could be used. Here’s how the kids decorated four different transportation vehicles using kitchen items. This was our simplest creation. The drink lid was used to create the cockpit. A straw was used to create the decorative line on the fuselage, the wings and the tail. Several kitchen items were used to decorate the fire truck. The wooden spoon was used to make the passenger section of the fire truck. After using the straw to create a space for the bumper, we added a snake of play dough to fill in the space. The edge of the drink lid made a great ladder pattern. The pouch cap was great for making the siren and tire sections. The edge of the drink container was used to make the details on the cowcatcher, the chimney, the top of the smoke box, and down the center of the train. The pouch cap was used for the tires and the circle at the front of the train. The wooden spoon was used to make the wheels. The drink lid was used add the bumpers. The bread tag was used to make the window and the lines dividing the cab from the bed of the truck. The straw made the line at the top of the bed. The pouch cap made the design on the bed of the truck. 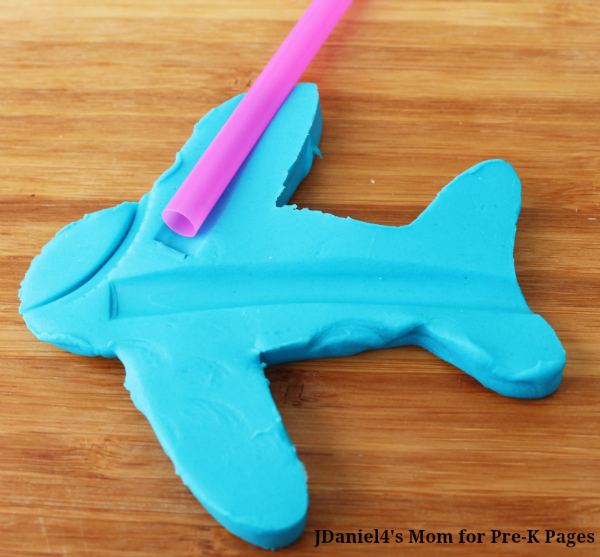 Your kids will come up with their own ways to decorate their transportation play dough cutouts. 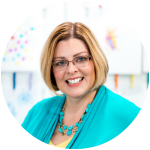 My hope was just to share with you some fun ways we used kitchen items to decorate our creations. 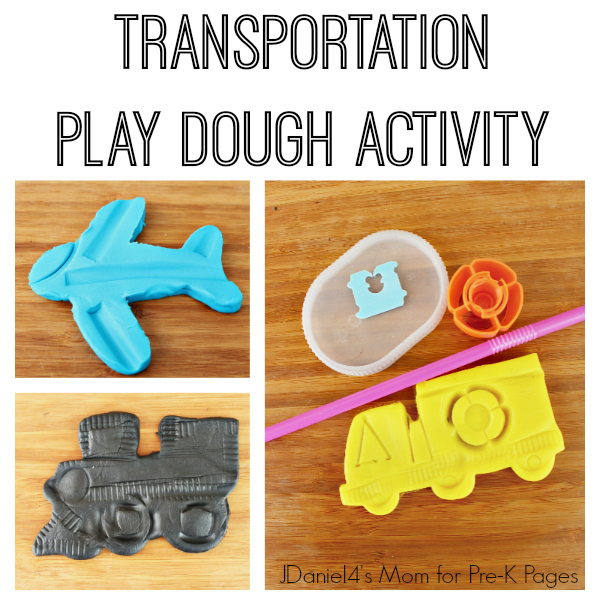 Encourage your kids to use their imaginations to create interesting transportation vehicles from play dough.